Roc C comes from the same fertile Oxnard hip hop proving ground that spawned Lootpack, Madlib, M.E.D., Oh No, Declaime/Dudley Perkins and DJ Romes. 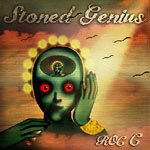 Long associated with trendsetting label Stones Throw, and after one solo album for them, he has fully taken control of his artistic vision with this self-released third effort on Kash Roc Entertainment, the aptly-titled ''Stoned Genius'', a start-to-finish ode to the higher side of hip hop. Deftly balancing his lyrically-oriented roots in the 90s backpack movement (guests Termanology, Big Pooh, Blu, Chali 2na), and a clear affinity for thick, sample-driven beats courtesy of veterans Alchemist, Madlib, Oh No and Jake One, as well as ''next''-tapped producers Lee Bannon and Lex Luthor, Roc C has accomplished the near-impossible task of augmenting his own style/flow/songs with guest talent, while not getting overpowered by the names in the room with him. The ''blunted'' theme of the album ties the package together, from the cover art (inspired by the 70s animation cult classic ''Fantastic Planet'') to the interlude dialogue to the general sonic quality of the beats - chopping odd sounds that draw from dancehall, rock, soul & reggae influences with a classic beat sensibility, the end result is a very cohesive, head-nodding and good trip through Roc C's storytelling mind.